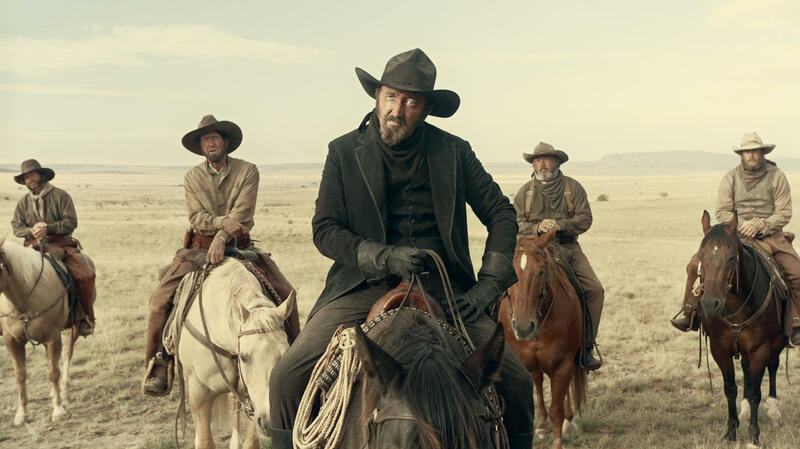 Ralph Ineson plays "the man in black" in "Near Algodones," the second segment of the Western anthology The Ballad of Buster Scruggs. Beginning Nov. 16, the film will play in theaters for a week before it becomes available for streaming on Netflix. Joel and Ethan Coen have an erratic body of work but a remarkably consistent worldview. So it's no surprise that their six-part Western anthology, The Ballad of Buster Scruggs, feels like both an entirely coherent vision and something of a mixed bag. The vignettes are wildly divergent in quality: There are shaggy-dog tales and grim morality plays, and one violently over-the-top farce. And yet somehow they all seem to be telling the same story: Life is cruel and absurd, comedy is indistinguishable from tragedy, and fortune smiles on someone only to turn around and kick them in the gut. That's more or less what happens in the amusing first chapter, which shares its title with the movie and tells the story of a wandering gunslinger and troubadour by the name of Buster Scruggs, played by Tim Blake Nelson. Buster likes to stride into a saloon and shoot up anyone who gets in his way. He also likes to brag about his grisly exploits in songs and soliloquies that should be grating but are instead weirdly charming, thanks to Nelson's good-humored grin and his habit of directly addressing the camera. The next two vignettes aren't quite as engaging; they're funny if unmemorable little doodles. In the second chapter, called "Near Algodones," James Franco plays a down-on-his-luck bank robber who ends up with his head in not one but two nooses. In the third tale, "Meal Ticket," Liam Neeson is a poor man's P.T. Barnum, and Harry Melling plays his circus attraction, a man with no arms and no legs who entertains crowds by reciting everything from Percy Bysshe Shelley's poem "Ozymandias" to the Declaration of Independence. There's nothing poetic, however, about how this chilly survival story plays out. The anthology improves significantly with its fourth chapter, "All Gold Canyon," which stars a wonderful Tom Waits as a grumbling old prospector who strikes it rich in an unspoiled mountain valley, only to realize he's not quite as alone as he thought. This funny, twisty little yarn is also the most visually stunning of the six: Bruno Delbonnel's immaculate cinematography, no longer limited to parched desert landscapes, pops to life in this world of blue skies, green hills and nuggets of gold. This is followed by an excellent fifth story, "The Gal Who Got Rattled," which sounds like a Dragon Tattoo sequel but is in fact the carefully plotted drama of a woman named Alice Longabaugh, played by a terrific Zoe Kazan, who embarks on the Oregon Trail shortly after her brother's death. "The Gal Who Got Rattled" has an emotional and narrative richness that the rest of the movie doesn't — there's a cute bit with a dog, a hint of romance and even a fleeting sense of hope. You might cringe at first when the characters are suddenly attacked by an indigenous tribe, though I admired the Coen brothers for not shying away from one of the Western's more problematic depictions. The movie doesn't villainize these warriors. Simply by acknowledging their presence, it reminds us that the other characters, the ones seeking a better life out West or digging for gold, are trespassing on their terrain. The last and eeriest of the stories, "The Mortal Remains," takes place almost entirely inside a stagecoach carrying five chatty characters, played by actors including Tyne Daly, Saul Rubinek and Brendan Gleeson. The group's lively, irritable bickering gradually takes on a darker, more unsettling tone. Anecdotes are exchanged and bizarre disclosures are made. The coach's final destination would appear to be smack-dab in the middle of Edgar Allan Poe territory. That fatalism is nothing new for the Coen brothers, who have made dark and despairing Westerns before: a classical one with True Grit, a modern-day one with No Country for Old Men. In The Ballad of Buster Scruggs, they gleefully embrace the conventions and clichés of the genre, but to strangely melancholy — even troubling — effect. As the Coens remind us, with their usual impish wit and impeccable craft, there's still a lot of pleasure to be mined from those conventions. But there are lessons to be learned, too. The road that seems to stretch toward manifest destiny often leads to brutality and death, one tall tale at a time. This is FRESH AIR. Joel and Ethan Coen's new movie "The Ballad Of Buster Scruggs" is a feature-length collection of six stories set in the Old West, featuring actors including Tim Blake Nelson, James Franco, Zoe Kazan and Tyne Daly. The movie is opening in select theaters for a week before it begins streaming on Netflix. Film critic Justin Chang has this review. JUSTIN CHANG, BYLINE: Joel and Ethan Coen have an erratic body of work but a remarkably consistent worldview. So it's no surprise that their six-part Western anthology, "The Ballad Of Buster Scruggs," feels like both an entirely coherent vision and something of a mixed bag. The vignettes are wildly divergent in quality. There are shaggy dog tales and grim morality plays, and one violently over-the-top farce. And yet somehow, they all seem to be telling the same story. Life is cruel and absurd, comedy is indistinguishable from tragedy and fortune smiles on someone only to turn around and kick them in the gut. That's more or less what happens in the amusing first chapter, which shares its title with the movie and tells the story of a wandering gunslinger and troubadour by the name of Buster Scruggs, played by Tim Blake Nelson. Buster likes to stride into a saloon and shoot up anyone who gets in his way. He also likes to brag about his grisly exploits in songs and soliloquies that should be grating but are instead weirdly charming thanks to Nelson's good-humored grin and his habit of directly addressing the camera and his horse, Dan. TIM BLAKE NELSON: (As Buster Scruggs) A song never fails to ease my mind out here in the West, where the distances are great and the scenery monotonous. Additionally, my pleasing baritone seems to inspirit old Dan here and keep me in good heart during the day's measure of hoof clops. Ain't that right, Dan? NELSON: (As Buster Scruggs) Maybe some of y'all have heard of me. Buster Scruggs, known to some as the San Saba songbird. CHANG: You can hear the Coen brothers' clever way with dialogue, the way they revel in arch, antiquated language while giving it their own playful zing. The next two vignettes aren't quite as engaging. They're funny, if unmemorable, little doodles. In the second chapter, called "Near Algodones," James Franco plays a down-on-his-luck bank robber who ends up with his head in not one, but two nooses. In the third tale, "Meal Ticket," Liam Neeson is a poor man's P.T. Barnum. And his circus attraction, a man with no arms and no legs, entertains crowds by reciting everything from Shelley's poem "Ozymandias" to the Declaration of Independence. There's nothing poetic, however, about how this chilly survival story plays out. The anthology improves significantly with its fourth chapter, "All Gold Canyon," which stars a wonderful Tom Waits as a grumbling old prospector who strikes it rich in an unspoiled mountain valley only to realize he's not quite as alone as he thought. This funny, twisty little yarn is also the most visually stunning of the six. Bruno Delbonel's immaculate cinematography, no longer limited to parched desert landscapes, pops to life in this world of blue skies, green hills and nuggets of gold. This is followed by an excellent fifth story, the carefully plotted drama of a woman named Alice Longabaugh, played by a terrific Zoe Kazan, who embarks on the Oregon Trail shortly after her brother's death. One night by the campfire, Alice approaches the wagon train's two leaders, played by Bill Heck and Grainger Hines, and asks them for help. ZOE KAZAN: (As Alice Longabaugh) Could I ask your advice, Mr. Knapp? BILL HECK: (As Billy Knapp) Certainly, miss. Would you like some supper or coffee with us? KAZAN: (As Alice Longabaugh) No, thank you. My hired boy, Matt, he told me that my brother promised him half his wages when we get to Fort Laramie. HECK: (As Billy Knapp) How much did he say that was? KAZAN: (As Alice Longabaugh) Two hundred dollars. HECK: (As Billy Knapp) Two hundred dollars is half? KAZAN: (As Alice Longabaugh) Yes. And the other half when we get to the Willamette Valley. GRAINGER HINES: (As Mr. Arthur) High price. HECK: (As Billy Knapp) It is an extravagant wage. KAZAN: (As Alice Longabaugh) Is it? HINES: (As Mr. Arthur) Well, it's a high price. KAZAN: (As Alice Longabaugh) I don't know. HINES: (As Mr. Arthur) That is a high price. CHANG: You might cringe at first when the characters are suddenly attacked by an indigenous tribe, though I admire the Coen brothers for not shying away from one of the Western's more problematic depictions. The movie doesn't villainize these warriors. Simply by acknowledging their presence, it reminds us that the other characters, the ones seeking a better life out West or digging for gold, are trespassing on their terrain. The last and eeriest of the stories, "The Mortal Remains," takes place almost entirely inside a stagecoach carrying five chatty characters, played by actors including Tyne Daly, Saul Rubinek and Brendan Gleeson. The group's lively, irritable bickering gradually takes on a darker, more unsettling tone. Anecdotes are exchanged, and bizarre disclosures are made. The coach's final destination would appear to be smack dab in the middle of Edgar Allan Poe territory. That fatalism is nothing new for the Coen brothers, who have made dark and despairing Westerns before - a classical one with "True Grit," a modern-day one with "No Country For Old Men." BIANCULLI: Justin Chang is a film critic for The L.A. Times. ROB DUNN: Every surface, every bit of air, every bit of water in your home is alive. BIANCULLI: We talk with scientist Rob Dunn about the microbes, fungi, bacteria, bugs and more that inhabit our homes. He says the average house has thousands of species in it. His new book is "Never Home Alone." Hope you can join us. (SOUNDBITE OF MOSCOW RADIO ORCHESTRA & KARL ELIASBERG'S "THE CARNIVAL OF THE ANIMALS: XI. PIANISTS") Transcript provided by NPR, Copyright NPR.